Killed December 2nd, 1914, by a posse near Caddo, LA. News reports indicate a third person escaped. 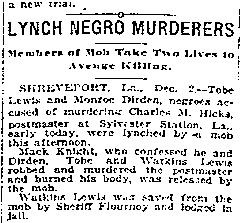 Three more lynchings in the area occurred the following week on December 11th. See the page for Charles Washington, Beard Henderson, and Watkins Lewis for more information.